Collision repairers can use their own photo estimating and scheduling apps to “capture a sale,” according to a Montana repairer which began offering the technology to customers earlier this year to great success. 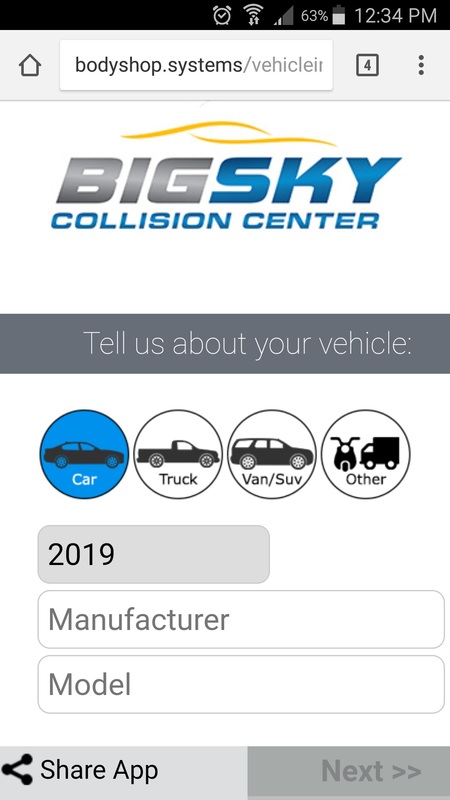 Matthew McDonnell, a Society of Collision Repair Specialists board member and owner of the local MSO Big Sky Collision, said he is drawing as much as $60,000-$70,000 in monthly sales from his app alone. It’s one of several marketing methods he and Body Shop Booster CEO Ryan Taylor — “possibly two of the most hyperactive guys” in the industry, McDonnell joked — will present at “Auto Body Growth Hacks” during SCRS’ Repairer Driven Education series at SEMA. OEMs and insurers poised to battle over telematics-generated referrals right at the point of impact. Shops need a way to stay competitive, according to McDonnell. 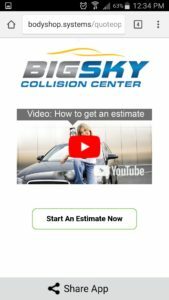 Big Sky Collision adopted Body Shop Booster’s app in January. The MSO’s “EZ Estimate Tool” is branded with the Big Sky logo. Text and a link promoting it are among the first things you see on the homepage of the Billings, Mont., branch. The “app” is actually in-browser — the customer doesn’t have to take the extra step of downloading yet another thing to the phone. A video walks customers through the process of describing the impact and taking photos of the damage. Big Sky Collision delivers a preliminary estimate from the photos and schedules a visit for a full teardown. The customer can do it all at their house — there’s no need to come in for a initial visit. Regardless of your feelings about the idea of photo estimating, McDonnell’s account and data from notable adopter Allstate suggests that customers — go figure — want convenience. Allstate claims innovation and customer experience Vice President Shawn Broadfield told the Connected Car Insurance USA conference earlier this month that the carrier had tested the adoption rate of QuickFoto Claim back when Allstate still offered drive-through centers. The centers could still take as long as half the customer’s day to receive was often a “simple estimate,” he said. Allstate tested going all-in on QuickFoto Claim in one area, and found 90 percent of customers liked the app, Broadfield said. Nearly all of its 850 drive-in locations in existence less than two years ago have since been shuttered. Customer photo quality isn’t an issue, McDonnell said, and the app walks them through the process of taking the images. Some of the photos are “better than our own people” would take, he said. McDonnell knows the photo estimate isn’t going to deliver the quality of a true estimate post-teardown. “I really don’t care,” he said. This is the distinction between using photo estimating for shops and what critics have argued about insurer photo estimating tools: There’s no implication to customers that a shop photo estimate is a final estimate and what the repair will truly cost. “I’m looking for the sale,” McDonnell said. Running a business isn’t just production, it’s also accounting and sales and marketing, he said. “I gotta drive the sales to the door,” he said. He said Big Sky Collision doesn’t have any DRPs, so it needs to capture customers before they’re referred to DRP shops. The shop isn’t deliberately trying to lowball the photo estimate as a bait-and-switch, according to McDonnell. “I’m not looking to underwrite,” he said. In fact, the shop makes a point of reaching out to customer-pay owners to stress that the photo estimate is likely not going to be the final bill, according to McDonnell. The shop writes what it can see, and it includes a line item declaring that a supplement will be possible, for the estimate was written off of photos alone. It also doesn’t attempt to order parts up-front based solely off the photo’s damage, which would just lead to a second post-teardown parts order, according to McDonnell. Instead, the shop waits and orders everything at once, he said. Customers who use the app don’t have sticker shock once the shop performs the teardown and writes the real estimate, McDonnell said. The shop educates them, he said. He said he didn’t think a single customer who used the app had complained about the supplement. McDonnell recalled a situation where an attorney found the shop organically by searching online. He saw the mention of the app as the fastest way to get an estimate, received the estimate, and was scheduled — and told the insurer he’d already been scheduled during that contact. Attend McDonnell and other speakers’ sessions by taking advantage of early registration for the Repairer Driven Education series and OEM Collision Repair Technology Summit at SEMA.